Own Jurassic Park (3 Film) Collection 1 - 3 4K Ultra HD from Deff, DVD, Blu-Ray & 4K Video Specialists - Free UK Delivery.. Experience one of the biggest movie trilogies of all time with the Jurassic Park Ultimate Trilogy! From Academy Award - winning director Steve Spielberg (Jurassic Park, The Lost World: Jurassic Park) and Joe Johnston (Jurassic Park III), the action-packed adventures find man up against prehistoric predators in the ultimate battle for survival. Featuring visually stunning imagery and groundbreaking filmmaking, this epic trilogy is sheer .. Celebrate one of the biggest movie franchises of all time with the Jurassic Park Trilogy Collection! From Academy Award-winning director Steven Spielberg (Jurassic Park, The Lost World: Jurassic Park), and Joe Johnston (Jurassic Park III), dinosaurs once again roam the earth in an amazing theme park on a remote island. The action-packed adventures find man up against prehistoric predators in the ultimate battle for survival. Featuring v.. Experience one of the biggest movie sagas of all time with the Jurassic Park Collection! From Academy Award - winning director Steven Spielberg (Jurassic Park, The Lost World: Jurassic Park), Joe Johnston (Jurassic Park III) and Colin Trevorrow (Jurassic World), dinosaurs once again roam the Earth in an amazing theme park on a remote island. The action-packed adventures find man up against prehistoric predators in the ultimate battle fo..
All four films from the 'Jurassic Park' franchise. In 'Jurassic Park' (1993) eccentric scientist John Hammond (Richard Attenborough) plans to open a theme park consisting of live dinosaurs, genetically engineered from DNA found in a preserved prehistoric mosquito. Archaeologists Alan Grant (Sam Neill) and Ellie Sattler (Laura Dern) are invited to view the park, along with chaos theory expert Ian Malcolm (Jeff Goldblum), only to find the..
Own Jurassic Park - Jurassic Park 3 Blu-Ray from Deff, DVD, Blu-Ray & 4K Video Specialists - Free UK Delivery..
Own Jurassic Park - Jurassic Park Blu-Ray from Deff, DVD, Blu-Ray & 4K Video Specialists - Free UK Delivery..
Own Jurassic Park - Jurassic Park The Lost World Blu-Ray from Deff, DVD, Blu-Ray & 4K Video Specialists - Free UK Delivery.. This high definition release of the second chapter of the Jurassic Park Trilogy is now bigger and fiercer than ever before! Director Steven Spielberg takes us back to the scene of Jurassic Park in The Lost World, one of the most successful films of all time that features an all-star cast including Jeff Goldblum, Julianne Moore and Pete Postlethwaite. Get closer to this blockbuster sequel with more dinosaurs, more action and more breatht..
Own Jurassic Park 2 - The Lost World - Jurassic Park DVD from Deff, DVD, Blu-Ray & 4K Video Specialists - Free UK Delivery.. Directed by Colin Trevorrow (Safety Not Guaranteed) and executive produced by Academy Award winner Steven Spielberg, one of the biggest movie franchises of all time gets even bigger with Jurassic World. 22 years ago, John Hammond envisioned a theme park where guests could experience the thrill of witnessing actual dinosaurs. 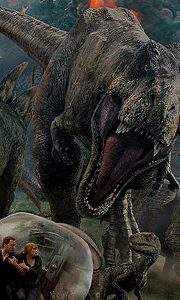 Today, Jurassic World welcomes tens of thousands of visitors, but something sinister lurks behind the park's attr..
Own Jurassic Park Trilogy Blu-Ray from Deff, DVD, Blu-Ray & 4K Video Specialists - Free UK Delivery..
Own Jurassic World - Fallen Kingdom Blu-Ray from Deff, DVD, Blu-Ray & 4K Video Specialists - Free UK Delivery..
Own Jurassic World - Fallen Kingdom DVD from Deff, DVD, Blu-Ray & 4K Video Specialists - Free UK Delivery.. The Jurassic World theme park lets guests experience the thrill of witnessing actual dinosaurs, but something ferocious lurks behind the park’s attractions – a genetically modified dinosaur with savage capabilities. When the massive creature escapes, chaos erupts across the island. Now it’s up to Owen (Chris Pratt) and Claire (Bryce Dallas Howard) to save the park’s tourists from an all-out prehistoric assault. Special Features Deleted..
Own Jurassic Park (3 Film) Collection 1 - 3 Blu-Ray from Deff, DVD, Blu-Ray & 4K Video Specialists - Free UK Delivery..
Own Jurassic Park (3 Film) Collection 1 - 3 DVD from Deff, DVD, Blu-Ray & 4K Video Specialists - Free UK Delivery..
Own Jurassic Park - Jurassic Park 3 DVD from Deff, DVD, Blu-Ray & 4K Video Specialists - Free UK Delivery..
Own Jurassic Park - Jurassic Park DVD from Deff, DVD, Blu-Ray & 4K Video Specialists - Free UK Delivery..
Own Jurassic Park - Jurassic Park The Lost World DVD from Deff, DVD, Blu-Ray & 4K Video Specialists - Free UK Delivery..
Own Jurassic Park - Jurassic Park The Lost World Steelbook 4K Ultra HD from Deff, DVD, Blu-Ray & 4K Video Specialists - Free UK Delivery..
Own Jurassic World - Fallen Kingdom 3D Blu-Ray from Deff, DVD, Blu-Ray & 4K Video Specialists - Free UK Delivery..
Own Jurassic World - Fallen Kingdom 4K Ultra HD from Deff, DVD, Blu-Ray & 4K Video Specialists - Free UK Delivery..
Own Jurassic World / Jurassic World - Fallen Kingdom Blu-Ray from Deff, DVD, Blu-Ray & 4K Video Specialists - Free UK Delivery..
Own Jurassic World / Jurassic World - Fallen Kingdom DVD from Deff, DVD, Blu-Ray & 4K Video Specialists - Free UK Delivery..
Own Jurassic World Fallen Kingdom - Dino Rampage Mug from Deff, DVD, Blu-Ray & 4K Video Specialists - Free UK Delivery..
Own Jurassic World Fallen Kingdom - Logo Mug from Deff, DVD, Blu-Ray & 4K Video Specialists - Free UK Delivery..
Own Jurassic World Fallen Kingdom - Raptor Wrangler Mug from Deff, DVD, Blu-Ray & 4K Video Specialists - Free UK Delivery..
Own Jurassic World Fallen Kingdom - T Rex Stats Mug from Deff, DVD, Blu-Ray & 4K Video Specialists - Free UK Delivery..
Own Lego Jurassic World - The Indominus Escape DVD from Deff, DVD, Blu-Ray & 4K Video Specialists - Free UK Delivery..
With the grand opening of Jurassic World's new super-secret dinosaur exhibit just days away, only one thing is missing - the dinosaurs! In order to get the job done, Simon Masrani enlists his newly-hired assistant, Claire Dearing, to ensure the new attraction opens on time.or else. Unfortunately, Owen Grady, the animal behaviorist Claire hired to deliver the dinosaurs, is late. From a runaway Gyrosphere, hang gliding with a Pteranodon, ..